Zephyr on the Charles is convenient to all corners of Cambridge and Boston with truly amazing panoramic views of the Charles River and the Boston skyline. While dining, you'll take in these views through expansive picture windows, or you may enjoy dining on the patio during the warmer months. Zephyr's menus capture the essence of classic New England cuisine with an emphasis on abundance and seasonality. You'll want to be sure to try the Seared Shrimp & Scallops with Roasted Vegetable Cous Cous - this dinner favorite, by our Executive Chef Robert Daugherty, was featured on TV Diner's Cookin' with Costa segment, and recently featured in StarChefs.com. Zephyr is perfect for after work gatherings, business meetings or get-togethers with family and friends. We welcome you to join us for breakfast, lunch, dinner, Friday night New England Seafood Market or cocktails. Come on Friday evenings and listen to live contemporary jazz music. Your parking is validated for up to three hours. 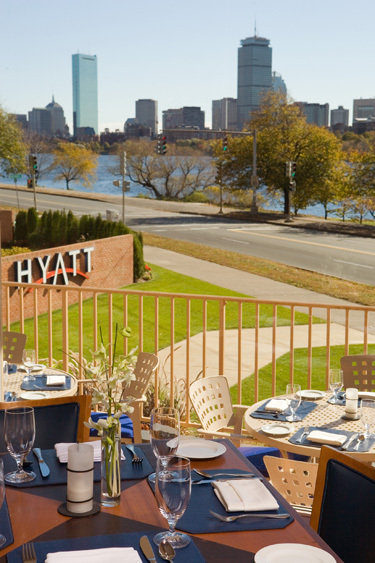 We look forward to seeing you at Zephyr on the Charles restaurant.